Taurus widgets behave just as any other Qt widget, and as such, they can be used to create GUIs in a regular way, both programmatically or using the Qt designer. For convenience, Taurus provides the taurusdesigner command that launches the standard Qt designer application extended to show also the widgets provided by Taurus. You can then design your application/widget using not only the standard Qt widgets but also the taurus widgets. You can use the Taurus Qt Designer to define a full GUI, but instead we recommend to create the GUIs using the TaurusGUI framework and use the Taurus Qt Designer just for creating widgets to be inserted as panels in a taurus.qt.qtgui.taurusgui.TaurusGui-based GUI. 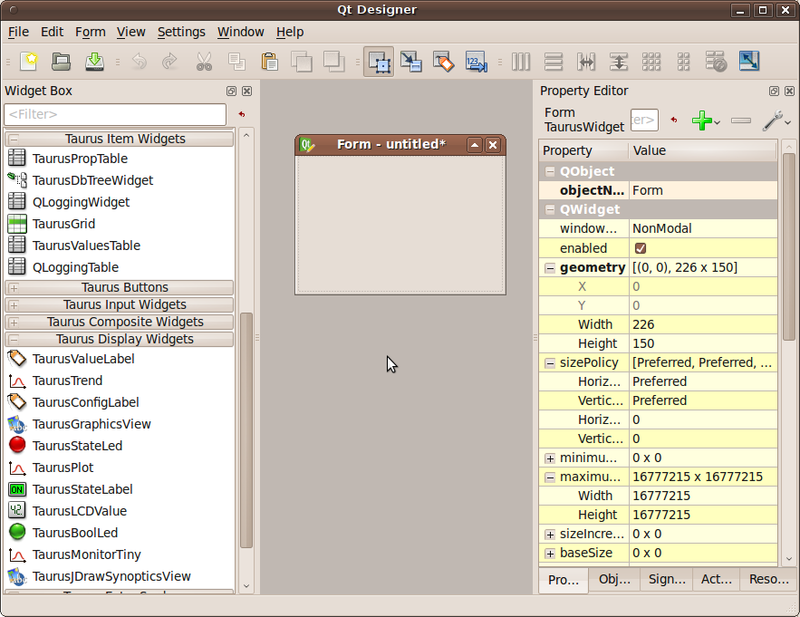 The Qt designer will produce a .ui file that is an XML representation of the application/widget that you designed. This .ui file can then be used in your own widget by using the taurus.qt.qtgui.util.UILoadable() decorator. See TEP11 for more details.